I was hungry. Really, really hungry. 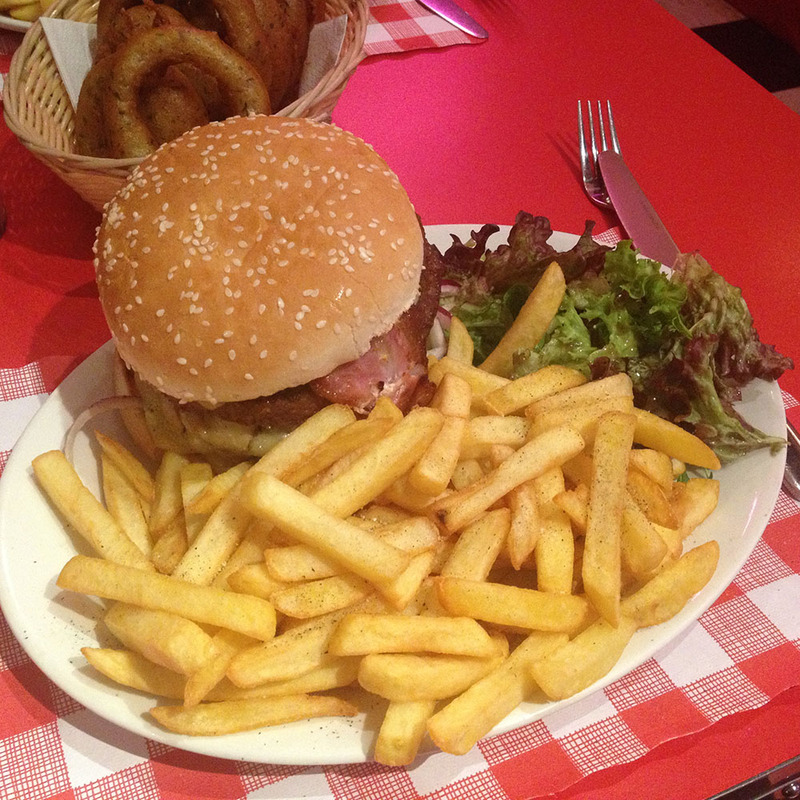 After spending most of Sunday hungover and nibbling feebly at whatever was put in front of me, and a meagre ham and cheese sandwich comprising lunch, I knew I was going all out at JB’s American Diner as we made the short walk to the coast to sit down for Monday night nosh. I’m not much of a spice man, so their Cross The Border (with coriander salsa and jalapenos) ruled itself out. As too did the Blue’s (sic) Brothers burger; I have to be in a very particular mood for blue cheese. I also think grilled pineapple in a burger is the work of the Devil, so the Honolulu never stood a chance. I’d have to keep it simple, then. 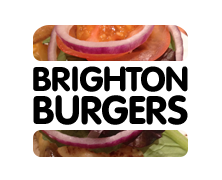 Step forward the JB’s Classic – staying true to its name with beef burger, lettuce, tomato and red onion, with fries and a completely redundant side salad thrown in for the price. I knew that wouldn’t be enough though; and JB’s knew that too, thoughtfully giving me the option of adding cheese and bacon (at 60p per item) and, the motherlode, doubling the patty for an extra £2.15. It was on, like Donkey Kong. Side-stepping the tempting shakes – I’d succumbed on my previous visit here a number of years ago, and barely dented my food – I plumped for a Dr. Pepper. My fiancé ordered a Diet Coke and the falafel burger, but I took about as much interest in that as I would watching the proverbial paint dry. With the orders placed, and stomachs rumbling like volcanos, we were at leisure to check out the decor. 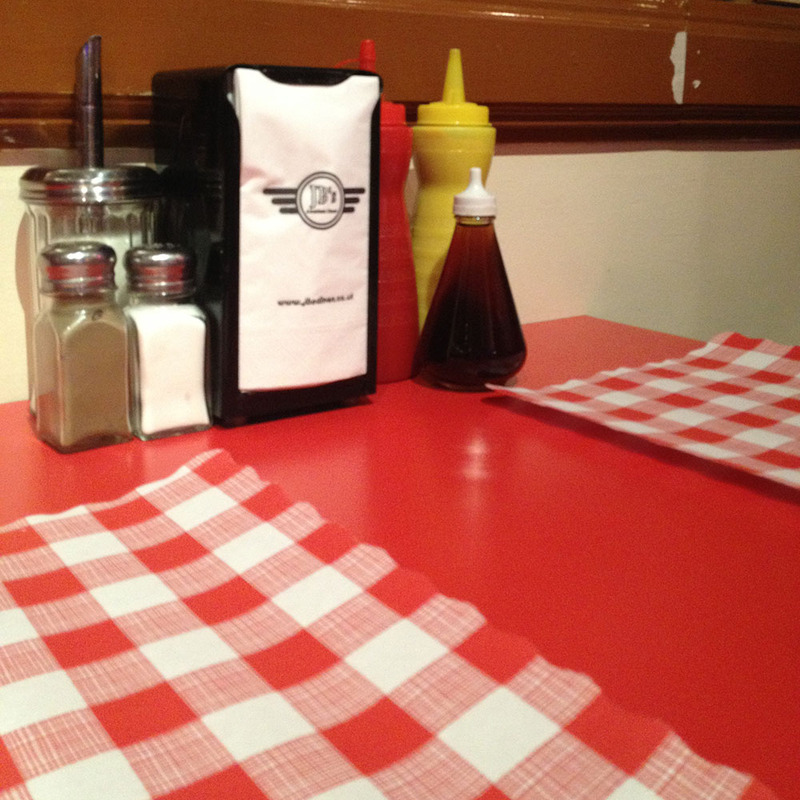 JB’s American Diner does a pretty good job of recreating the formative days of the American burger joint, resplendent in red leather, polished chrome and a floor of black-and-white checks. A life-size statue of a US highway cop greets you on your way in, and every inch of every wall (and even the ceiling) is covered in pictures of stars you might expect (Elvis) and those that are a little more puzzling (Jessica Biel). To cut a long story short, if it’s even remotely Americana-related or burger-related, it’s up on the wall. Complete with non-stop, chirpy hits from the 50s and 60s, JB’s has the kind of environment that is cool and quirky for the customers, whilst simultaneously guaranteed to drive its permanent staff slowly insane. 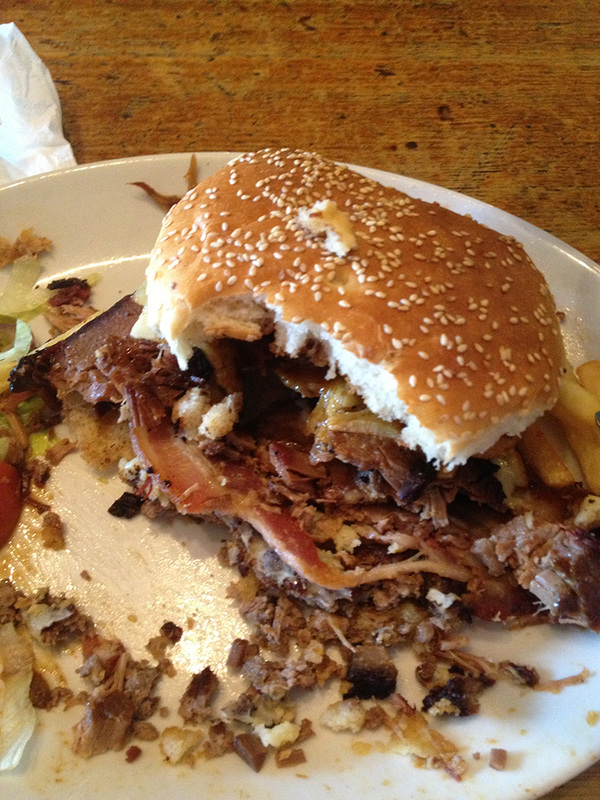 The waitress mumbled something about a ‘monster’ as she gave me my plate. I couldn’t tell whether she was describing the burger, or me, for ordering such a thing. 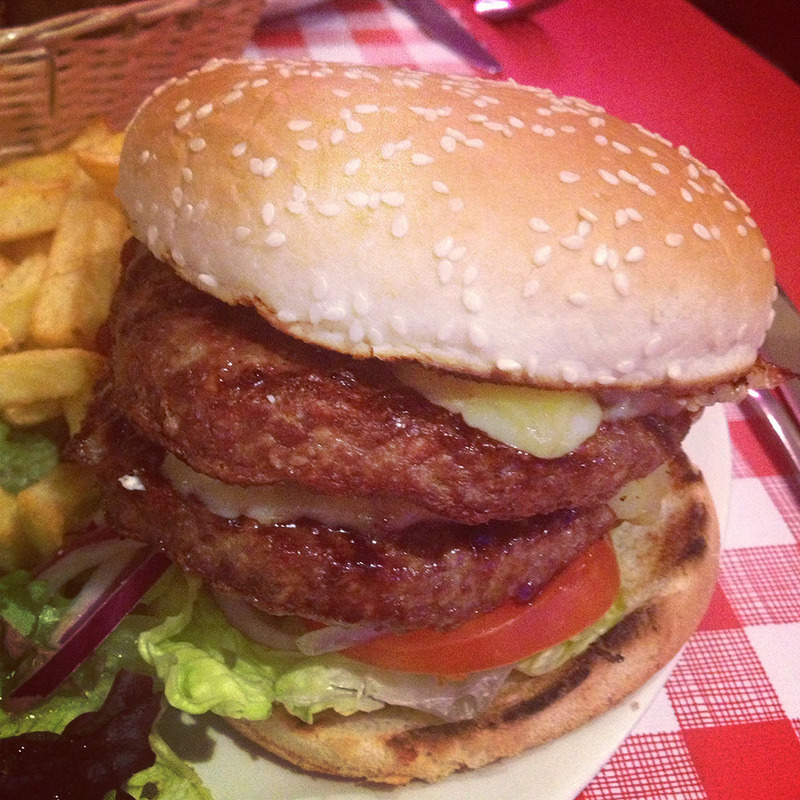 She was accurate either way – a doubled-up burger at JB’s Diner is an indulgent, gluttonous thing. 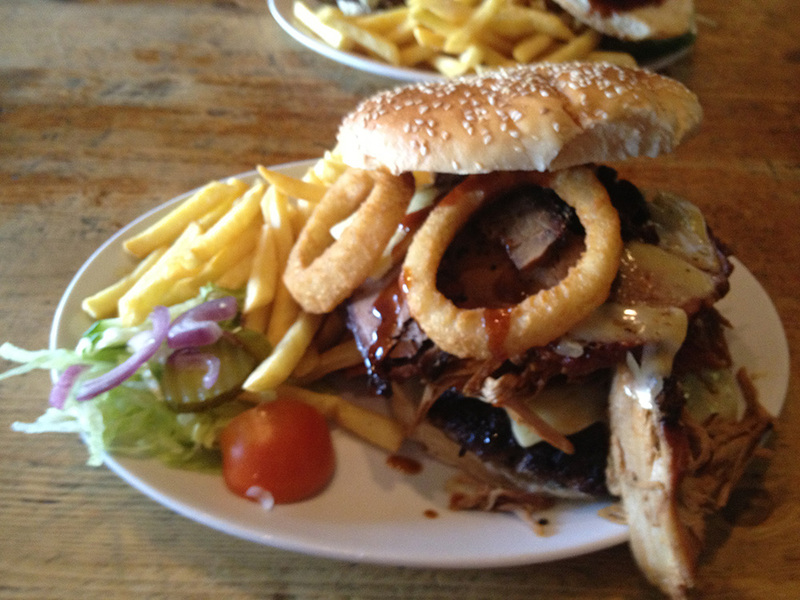 I knew I’d erred the instant it was put down in front of me; I would be no match for this towering beast. 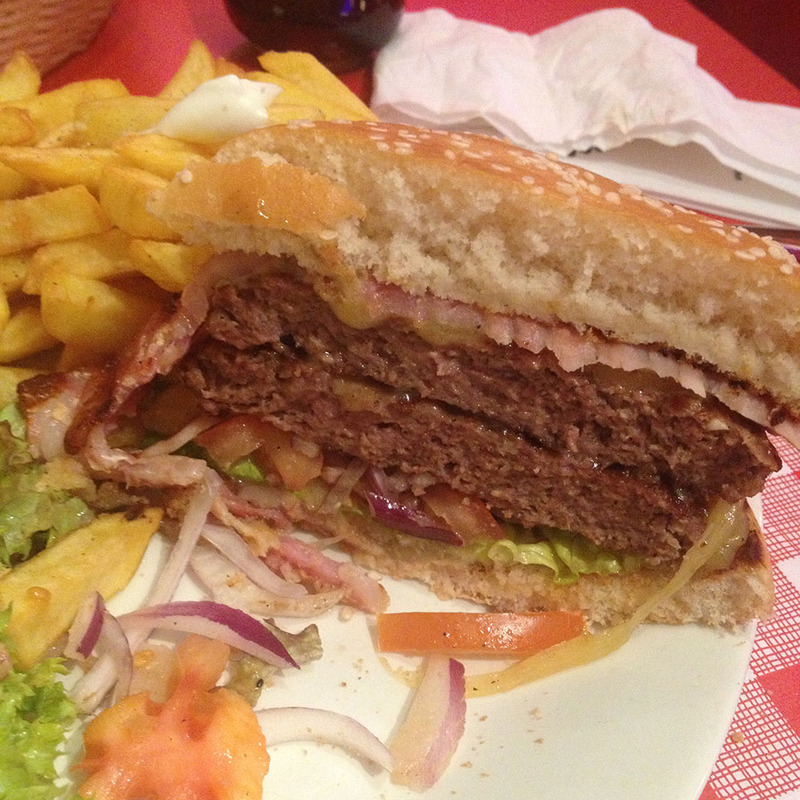 The first bite was just sheer beef, punctuated only briefly by that raw red onion lurking underneath the patty duo. As I’ve mentioned before, I’m not a fan of raw red onion, but I know it’s a standard burger item so I let its inclusion slide. The added cheese and bacon were undetectable, however, hidden underneath that explosion of meat flavour caused by two very dense patties. There weren’t any complexities of flavour from the beef either; no hint of seasoning, no chargrilled notes, no texture to speak of. Just dense and moist, and all-consuming. Towards the edges of the burger, the cheese (melted and hardened again, by this point) and bacon finally got a look in. If you go for a doubled JB’s Classic yourself, feel free to skip them as you’d hardly notice their absence anyway. Perhaps they play a more prominent role if you’re saner than I am and choose just the single patty. Finally, I’ll eat my hat if this isn’t a supermarket-bought seeded bap out of a pack of six. The slight charring on the inside edges wasn’t enough for the bottom half to disintegrate into a soggy mess, pitching the whole she-bang into disarray over the plate long before I’d finished it. 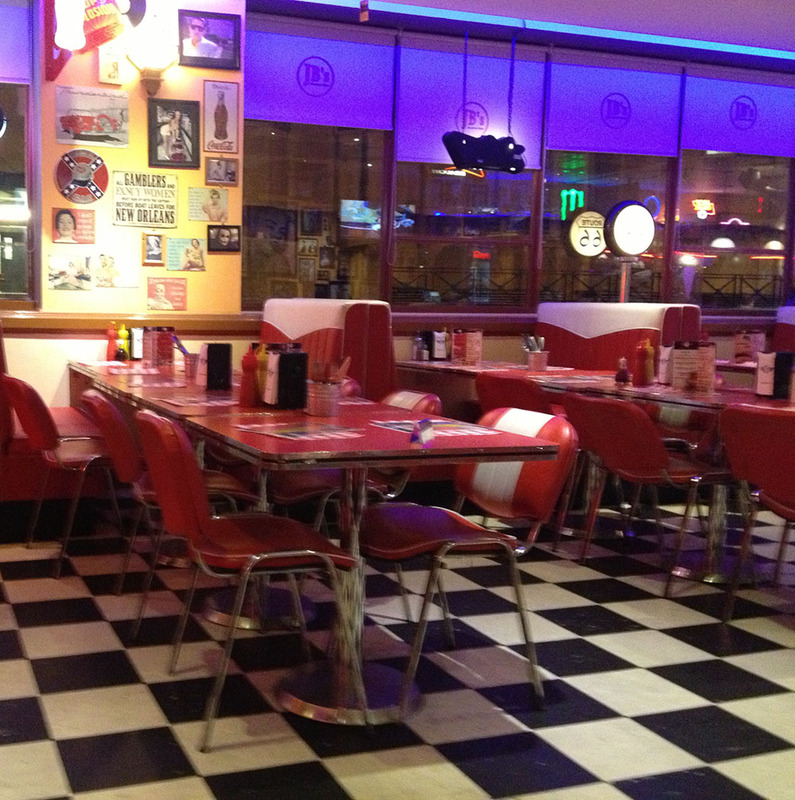 To give JB’s American Diner its due, they do give incredible value for money. 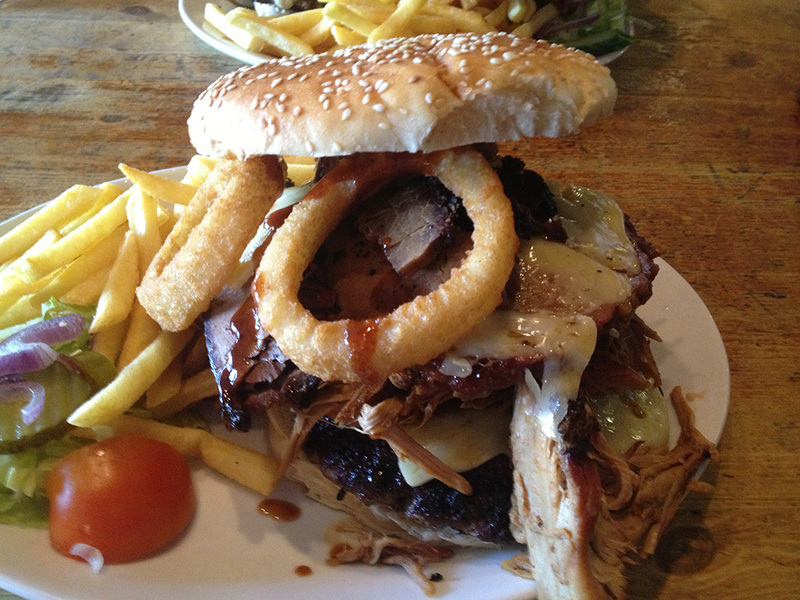 If the burger wasn’t enough to finish me on its own, the heaped mound of fries on the side certainly would have done the job. Light and crispy, they were unmemorable but plentiful, forming the bulk of the meal. The side salad, as predicted, stayed untouched. When I’m eating a burger, I know I’m being unhealthy (especially with this bad boy), so why bother trying to mitigate the fact? 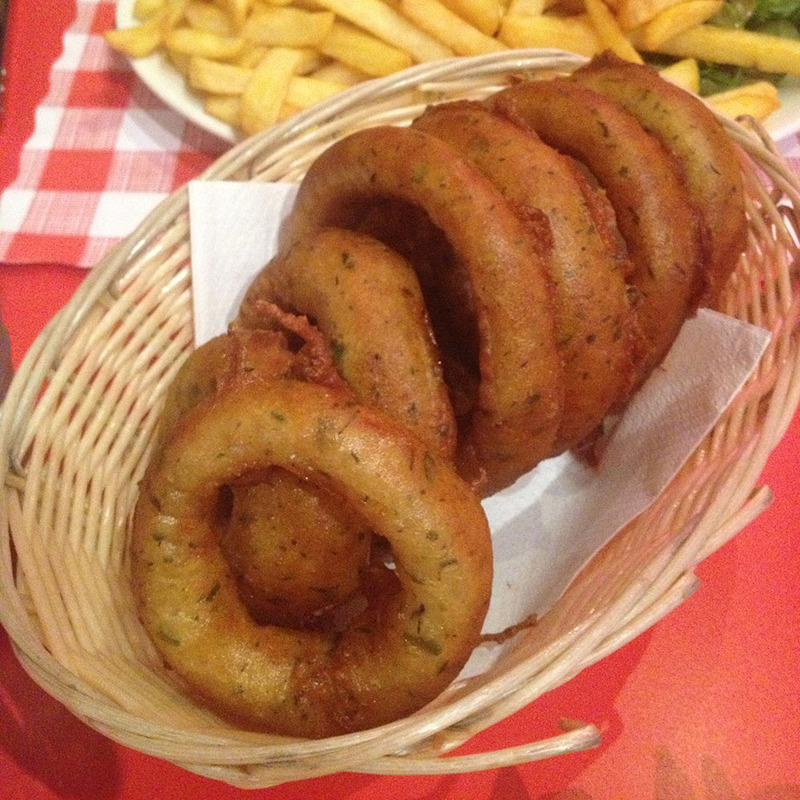 More surprising were the Jumbo Onion Rings, found on the Appetisers menu, but which we requested alongside our meals. They’re a little steep at £3.75, but are definitely as advertised; six jumbo battered rings, shot through with green splinters of thyme, and actually a very tasty side dish. I left a third of my chips and about four bites of my burger, lowering my cutlery a broken man. We briefly flirted with the idea of ordering a dessert to split between us – I had my eyes on either the Mississippi Mud Cake or the Chicago Cheesecake – but we came to our senses before taking the plunge. The waitress didn’t seem surprised. I’m sure I’m not the first customer to be downed by one of their double-sized behemoths. As we paid the bill, which was very, very reasonable, considering the amount of food we’d been served, I realised I was completely sated, but not entirely satisfied. JB’s American Diner scratches a nostalgic itch for a time I never knew, only pieced together by fragments of old movies and books, and then cranks it up to number 11, cramming every ounce of Americana it can into the mix, whether it fits that 50s diner theme or not. There’s something a little soulless about it that I can’t quite explain, whilst at the same time being an enjoyable, decadent way to spend a few hours. I can recommend it quite easily, but (as cemented by the uncomfortable bloatedness I felt for the rest of the evening), I won’t be in a hurry to go back. Unless it’s for that cheesecake, of course.